In 2015 we saw a couple of WorldTour teams using skinsuits with integrated transparent number pockets – Lotto Jumbo NL in the Tour de France and then Movistar in the Vuelta. 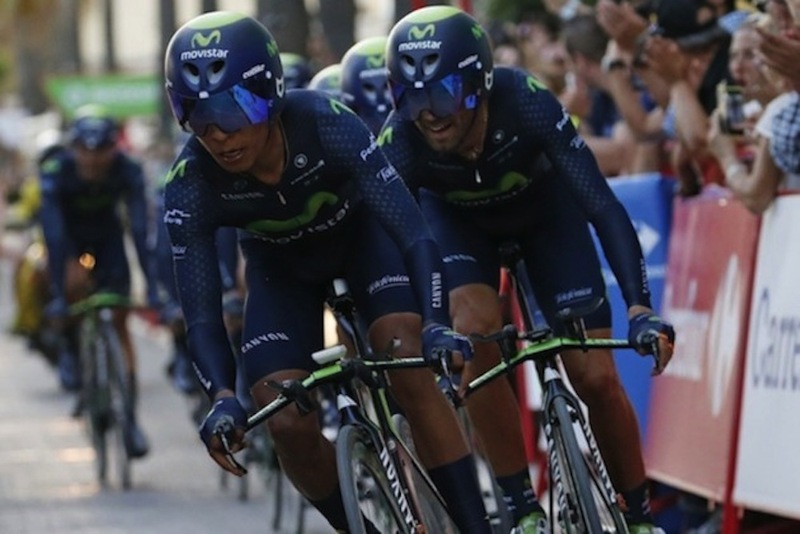 Some may have thought this was a short term fad, but with Movistar wearing its new top of the range skinsuit – with the number pockets – in the Tour de San Luis team time trial it looks like they are here to stay. The practicalities of getting kit to the Tour de San Luis resulted in teams using a wide variety of kit. This included road bikes with/without bolt-on bars and helmets ranging from long tailed time trial helmets to standard road helmets which favour ventilation over aerodynamics. Transporting skinsuits was obviously far easier than time trial bikes etc. As a result, despite not having the most aerodynamic bikes or helmets, all the teams wore skinsuits to help the riders slice through the air. However, Quintana and co were the only ones to use the innovative transparent pockets – which may have helped them to finish only eight seconds behind Etixx Quickstep. Movistar won’t be the only professional cycling team using Endura’s latest technology as this Scottish company is about to supply the Cervelo- Bigla women’s team with similar suits. If you have been a regular at domestic time trial events you are likely to have noticed riders wearing skinsuits with a transparent pocket from British company Nopinz. Using a transparent pocket to stow your number has several claimed benefits. The first may not be a concern for pro teams, but not having to use pins to fix your number should improve the longevity of the skinsuit. Secondly, the pocket will ensure the number is consistently in the optimum position – not too low or too high up the rider’s back – and keep it flush to the rider’s back which should mean air flows smoothly over the rider rather than causing drag.